Google has introduced a new Google Docs for Android app - which will allow you to use the camera on your handset to turn photos into editable text. Google is keen to show that its Docs offering can be used on any suitable device, and the latest Android offering brings a host of new features. They include better filtration, easier sharing and some nifty new tricks that take advantage of the handset's camera. "Using the app and your phone's camera, you can turn photos with text into editable Google documents with the power of optical character recognition (OCR)," blogged Google Docs software engineer Reuben Kan.
"Just create a new 'Document from Photo' or select the camera icon from the widget, and your converted document will appear in your documents list shortly after you snap the picture. "You can also convert photos already stored on your phone by sharing them with the Google Docs app. "OCR does a pretty good job capturing unformatted text in English but won't recognise handwriting or some fonts - stay tuned, it will get better over time!" 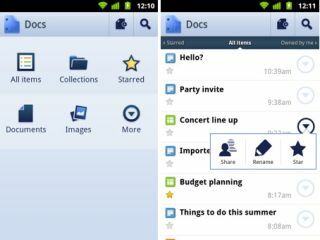 The Google Docs for Android app is available free now from the Android store.